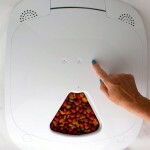 Wopet 1-meal is an automatic cat feeder that allows you to feed your cat one meal at the time you select. The unit features a counter clock timer and you can set the time of dispensing by choosing the numbers of hours ahead of the present time. 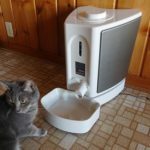 The unit can dispense dry or wet food and it features an ice pack to keep wet food fresh. You can attach this feeder to another one with special clips so you can make a 2-meal feeder or more. You can make it a 2 or 3 meal auto feeder by attaching one or two units on your existing feeder. Counter clock dial timer allows you to choose one meal within 48 hours. Wopet 1-meal automatic feeder works with a dial that you need to turn to choose how many hours ahead you want the unit to open, lining up the arrow to the number of hours you choose, similar to a kitchen counter clock. For example, if you are setting up the feeder at 5 pm and you want it to open at 8 pm you need to move the dial 3 hours lining up the arrow with the mark that represents the 3. 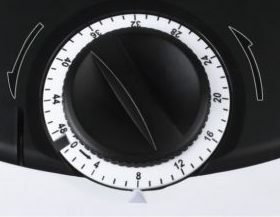 The numbers on the dial are every 4 hours, the rest are only marks (as seen in the picture). 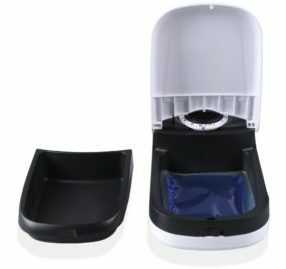 The mechanism of the feeder is simple and very similar to the Catmate C10; the lid features a small tab that gets under the dial, blocking the lid from opening and the dial has a small opening that when matching the latch it releases the lid to open. The feeder is suitable to dispense dry and wet food but during hot weather is advisable to feed only dry food unless you want to use it within 3 or 4 hours (check the tips if you want to use it longer with wet food). Wopet doesn’t feature a power ON/OFF button but it has a locking switch mechanism in front of the unit that you need to switch to the left (facing the feeder) that allows you to keep the lid closed without the timer working. When in locked mode, the feeder won’t dispense, this feature is only good if you don’t want to use the feeder and you want to keep the lid closed and stop the dial from turning and using the battery. As long as the feeder is set up to dispense at a certain time, once the unit dispenses the meal, the timer will keep running because it has a 48 hours range and the dial will do the whole turn. Also, the lid will stay open after dispensing the food. 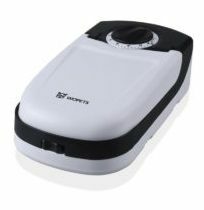 It doesn’t have an On/Off power button, only a manual locking switch that will keep the lid closed. For the above reasons, the ticking sound doesn’t stop after dispensing. When setting up the feeder make sure to unlock the locking mechanism, otherwise the feeder won’t open. The switch is in front of the feeder. If you want to feed your cat fresh wet food for longer than 3 or 4 hours put the wet food in the refrigerator, plus you need to freeze the ice pack. Both things will do the trick. By purchasing replacement bowls you can leave wet food in the refrigerator for the next meal. Also, as the ice pack will melt, a good idea is getting ice pack replacement. Wopet is a simple automatic feeder that will serve the purpose of feeding your cat one meal at the time you want. 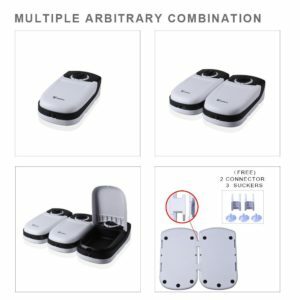 This unit allows you to create a 2-meal or even a 3-meal feeder by buying extra units and attaching them with the provided special clips. Wopet helps you to feed your cat so you don’t have to wake up at 4 or 5 to feed it. The unit has some cons but the feeder is simple and convenient to operate so they are easy to overcome.